In a different country, it would be a policeman fending off against the assault on women by a hound of rabid civilians dragging them violently in the street in plain view, but this is Egypt. 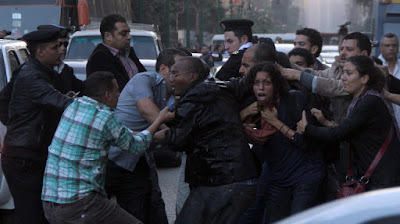 It was a passer-by, an ordinary young citizen from Aswan, who saw women being dragged and beaten by men in plain clothes and was moved to intervene to protect the women. Ahmed Abdel Rahman was arrested when it turned out that the thugs he had been protecting the women against were plain clothed policemen, and for his chivalry he was sentenced to five years in prison. His sentence matches that handed to one of Egypt’s most prominent prisoners of conscience, Alaa Abdel Fattah, sentenced in the same case. The Shura Protest, as it came to be known, was a protest planned before the Protest Law was issued on 24 November 2013, but took place just after, on 26 November. It protested articles in the constitution at the time of its writing which allowed for the military trials for civilians, thus denying citizens a fair trial. Most of the Shura protest prisoners had their prison sentences pre-empted after serving over a year, through a presidential pardon in September 2015. The chivalrous Ahmed Abdel Rahman was not among those pardoned. It is unlikely that the names pardoned were picked at random; it is almost certain that those imprisoned in political cases were all on the same list, including names like Alaa Abdel Fattah, Ahmed Douma, Mahienour El-Massry, Ahmed Maher and Mohamed Adel. Somebody at the top studied the list and scratched off the names that should not be pardoned. As frustrating as it is that some names were scratched off the pardon list, it’s still understandable that they were viewed as political adversaries to the regime. But what doesn’t make sense is to scratch off Ahmed Abdel Rahman’s name from those who would be pardoned. Why would he remain while others have been freed? This young man was not even part of the political protest. The explanation that it is incompetence is one we’ve grown accustomed to, but seeing a name and scratching it off seems far more deliberate. How was Ahmed Abdel Rahman described to the pardoning authorities? Was he described as a name caught up in the events, who had nothing to do with the political opposition? Were names picked based on those whose release resulted in a political win? Or was he perhaps described as a passer-by, who had nothing to do with the cause that was protested? That he did not think much about the dangers of entrenching military trials for civilians in the constitution, but felt compelled out of sheer humanity to stand up against an injustice he witnessed? One of the first protests I witnessed was the famous Khaled Said protest in Lazoghli. “The regime’s biggest threat is the average protester; someone who is not well connected, not overly political and not influential,” explained a human rights defender who had monitored similar protests as we watched protesters beaten and dragged away. He explained that the regime will let go of political activists, but their fear is when an average citizen turns into a protester. Perhaps that’s how Ahmed Abdel Rahman was reported, as a citizen capable of becoming politicised, daring to stand up to plain clothed thugs. Maybe he was too reminiscent of Sambo, another citizen who helped organise protests against the police back in November 2011 and was referred to a military tribunal. Protesters are anything but average at times when the regime has made it clear that the risks include being shot, assaulted, tortured and imprisoned. Likewise, Ahmed Abdel Rahman is no average citizen; he is someone who has moved in defence of the defenceless, against a group that does not even uphold their own laws. For that, he was crucified with the rest, and while many were released, he remains. That innocent people remain locked inside the regime’s prisons is not surprising, having been attested by President Abdel Fattah Al-Sisi himself in a publicised speech. Even now, Shawkan, a photojournalist, remains in prison without trial exceeding the maximum time allowed for pre-trial detentions as stipulated by the Egyptian law. Likewise, Mahmoud Hussein, who was arrested while still a minor, remains in pre-trial detention for over 600 days for wearing a ‘no to torture’ t-shirt. Ahmed Abdel Rahman would have been the first released after his arrest, he would have been the first acquitted in a trial, the first pardoned irrespective of the political misgivings Al-Sisi has with politicised youth. But this is not a different country, this is Egypt. First published in DNE on 6 October 2015. Translated to Arabic in Sasa Post.